I went to the pool with my kids today. Apparently, my community finally hired their first cool employee. The pool now has outdoor speakers installed, and today someone left on the Sirius XM station that plays pretty much Sting and Neil Young exclusively. So whoever you are, thank you! 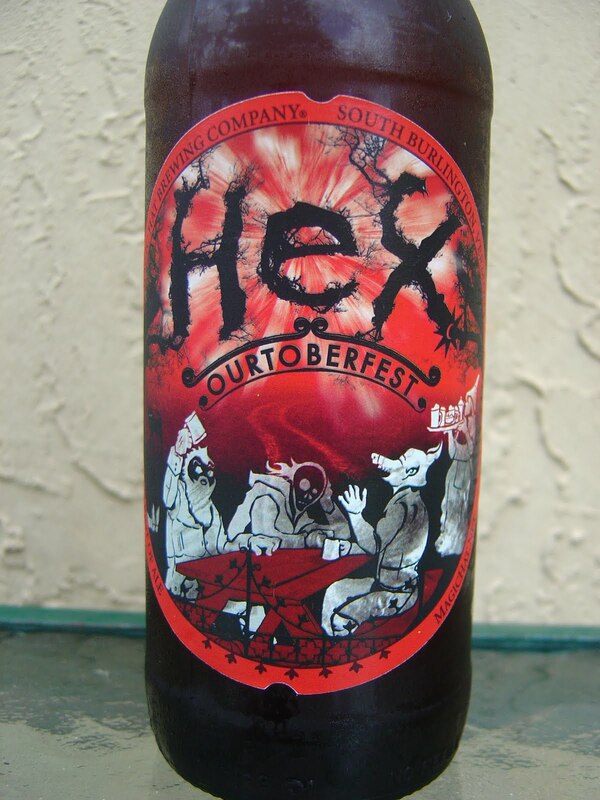 I picked out Hex Ourtoberfest brewed by Magic Hat Brewing Company in South Burlington, Vermont. 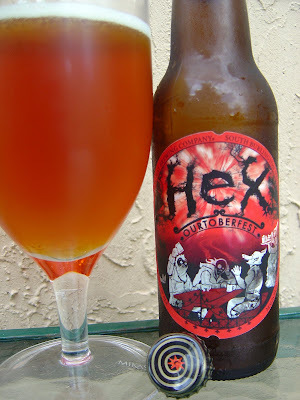 On the label, crazy half-Halloween strange creatures are sitting at a picnic table, enjoying a few pints of beer. Fall seasonal--OK whatever--I already told you I went swimming for hours today! I'm not even slightly surprised by the story on the neck label. "Our mysterious melange of time-honored ingredients harmonize with chaotic chemistry, humble patience, and blind faith to create unique beers to share in the rousing company of kindred spirits." These dudes at Magic Hat are pretty weird! Sweet caramel and bread aroma with some sugary soda and even a little fruit. Sweet flavors kick things off as well. Very sugary, with plenty of caramel and bread. Some hops do show up to take the edge off of the sweetness, but not entirely. Orange and tea flavors also linger in the background. There is one other strange flavor component, and no, I'm not saving the best for last. I can't entirely put my finger on it, but perhaps I can best describe it as cat-piss soaked cardboard! Good carbonation, dry finish. Was OK but I'll never drink it again. I grabbed the Magic Hat variety pack today, which included the Hex. I felt the same as you, OK beer, but I wouldn't go out of my way for it. 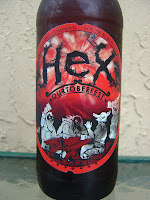 I might have forgotten some great Magic Hat beer, but if not, I pretty much feel the same way about all of their beers. Glad I read this. Thought about buying it today and you've persuaded me to head in another direction. Thanks! Weird as usual. They even wrote on their bottle that you can expect it to be weird--they delivered! Haven't had anything earth-shattering from MH either. Lucky Kat was tolerable, but the bottle art trumps the taste almost every time. It's all about the buzz. At 5.4% alcohol you might wonder if this is 30 minute guaranteed hangover. It is not. If you like a tart lemonade you'll love this beer. Hey Dakota. 5.4% is not a hangover beer unless you drink half a dozen in a short time. Oh, and I love tart lemonade and am not even close to loving this beer. Sorry. It's not sweet like the review said. Did the recipe change since last year? Certain beers and wines have chemical compounds that produce an instant hangover headache within 30 minutes or less--no money back. Those beers are stored at one end of the refrigerator at the Safeway near me.